This multipurpose brooch is gold plated and is adorned with smoked topaz crystals. Fasten it to your gown, scarf or hair, you are bound to look gorgeous! Very Elegant, Dainty & Sleek. Use it for decorating scarf or dresses or as a gift set for holidays. Material Used : Gold plated metal alloy brooch with smoked topaz crystals artistically decorated all over the brooch with a metal pin clasp. This item in Anklets / Bands / Brooch category was first added to our catalog on 11-07-2013. 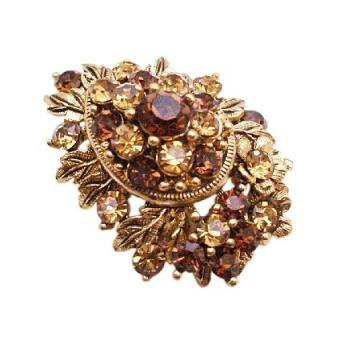 Buy Smoked Topaz Golden Shadow Crystals Brooch, sold & shipped by Fashion Jewelry For Everyone where you can shop online for Leading Online Retailer for Indian Fashion Jewelry. This Brooch, Pins & Bands collection has been tagged as brooch, pins, wedding, gift set, cake decoration, holiday gift.